Image is photo with text. Photo is a close-up of a baby's seat in a emerald and off white woven wrap Risaroo Dogwood Emerald. Off to the side is text that states quote Wrapping School with Amy Wraps Babies end quote. 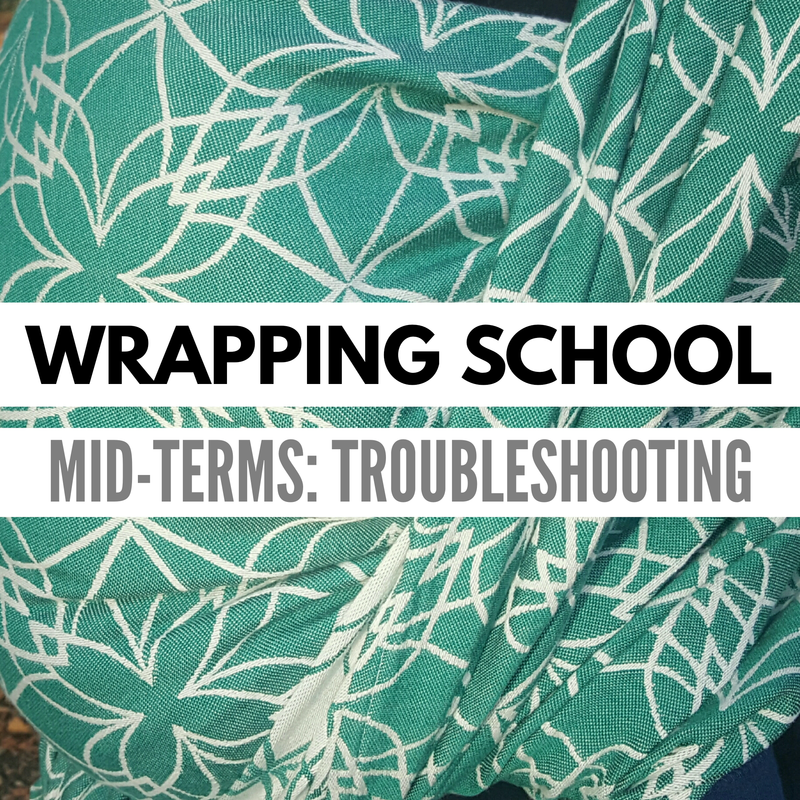 A whole week devoted to the basics of wrapping! Here's a preview of what's to come this week. 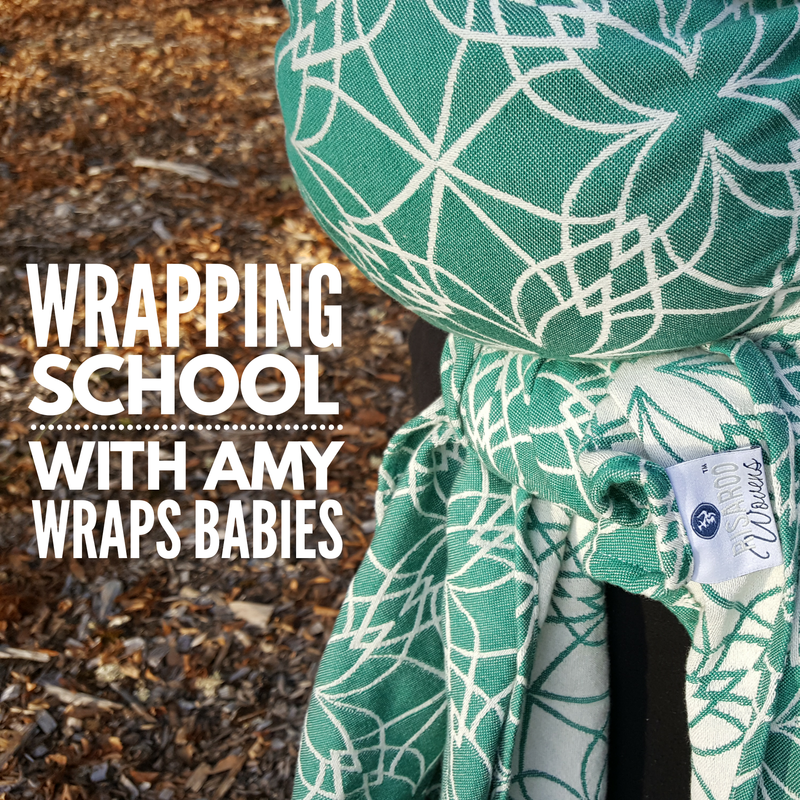 We'll be building up resources along the way so be sure to check back to amywrapsbabies.com/wrapping-school for updates! Image is a close-up of a emerald and off white woven wrap Risaroo Dogwood Emerald. Text on the image states quote Wrapping School, 101 how to get started, end quote. ​Here's the video if you missed it! If video isn't your thing, no worries (and with my toddler in the background I don't blame you!). Here's a post with the same 3 steps and all the extra tips for getting a wrap, learning the safety fundamentals, and tying on your first carry. Get more tips on trying wraps before you buy wraps. 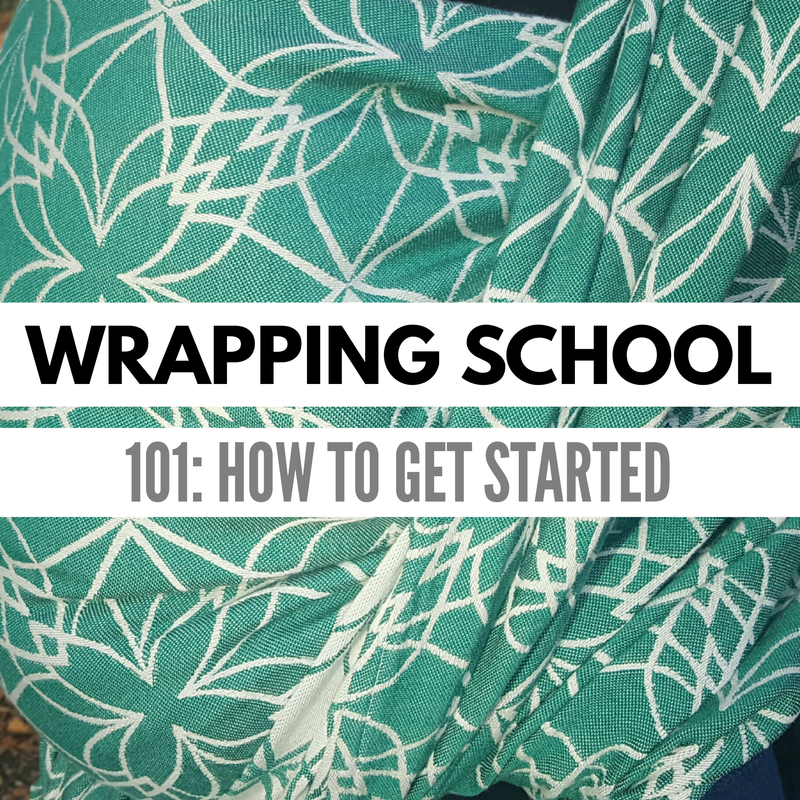 When you're ready to buy a wrap, we've got pointers for that too! Or, you could win a wrap from Risaroo Wovens this week! Enter on our Facebook page! Closes Sunday, September 25th! Now that you have a wrap and know your safety basics, it's time to tie that wrap on! Here are the first three carries that I love to teach new wrappers. Wrap Sizes: what is "base", what does it matter, and what is my size? Here's a post all about wrap sizes. Base size, shortie, minus two - what does it all mean? And what size do I start with already? Find out here. Knowing the parts of a wrap helps us troubleshoot more easily. Here's a handy list and diagram. 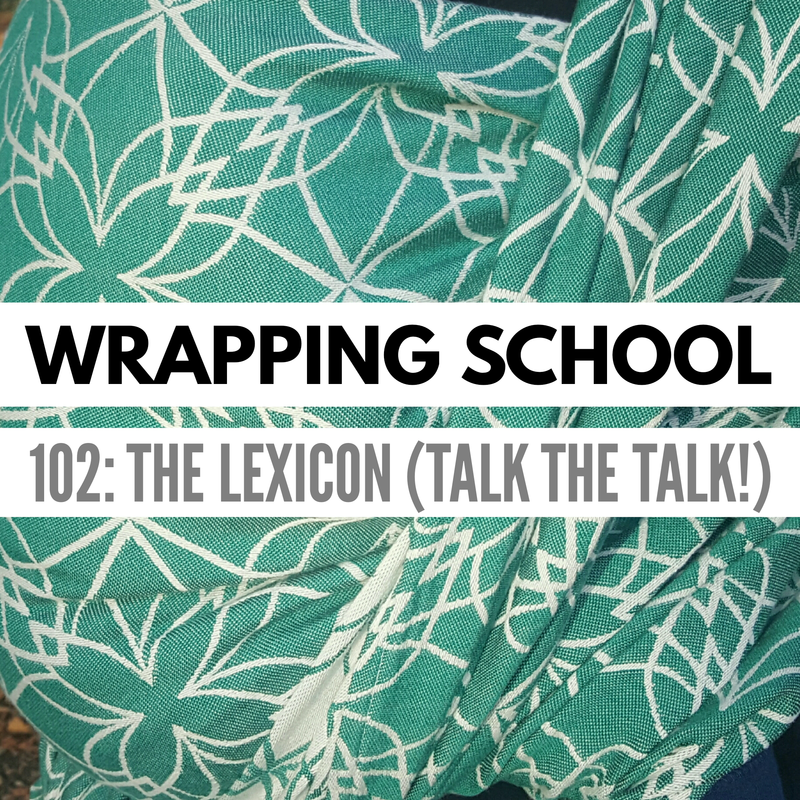 Wrapping is filled with interesting words and a ton of acronyms! Here's a list of common terms and common phrase abbreviations. Looking for more carries to try? Keep going with that Front Wrap Cross Carry!! (or Front Cross Carry if you prefer.) The more you practice the better you'll be. If you've got a short wrap that you're needing to try, check out my favorite first carries for a short woven. Image is a close-up of a emerald and off white woven wrap Risaroo Dogwood Emerald. Text on the image states quote Wrapping School, mid-terms, troubleshooting end quote. We answered some common questions about Front Cross Carry and Front Wrap Cross Carry, even a little back-carrying! in today's live class. Here's the replay if you missed it! Image is a close-up of a emerald and off white woven wrap Risaroo Dogwood Emerald. Text on the image states quote Wrapping School, 201 how to get baby on your back end quote. Ready to move on to back carries? Let's talk about that! Day 5 - Wrapping School Graduation! Review and Graduation Day! You've made it to the end! ​There are no final exams in Wrapping School, but there will be a cumulative review. We'll take today to return to key points to remember as you continue on your wrapping journey. Check back all week for more resources added!